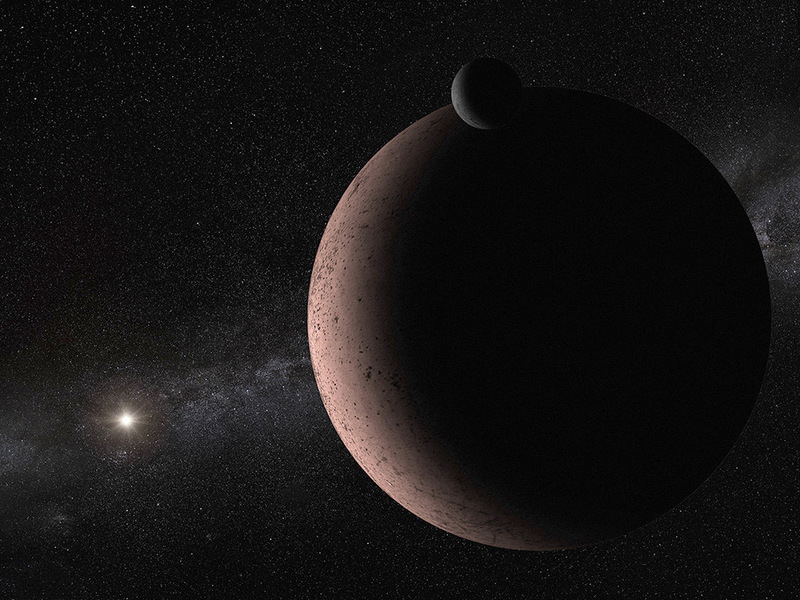 This artist’s concept shows the distant dwarf planet Makemake and its newly discovered moon. Makemake and its moon, nicknamed MK 2, are more than 50 times farther away than Earth is from the Sun. The pair resides in the Kuiper Belt, a vast reservoir of frozen material from the construction of our solar system 4.5 billion years ago. Makemake is covered in bright, frozen methane that is tinted red by the presence of complex organic material. Its moon is too small to retain ices as volatile as methane, even given the feeble heating by the very distant Sun, and likely has a much darker surface. MK 2 is orbiting 13,000 miles from the dwarf planet, and its estimated diameter is roughly 100 miles. Makemake is 870 miles wide. Illustration credit: NASA, ESA, and A. Parker (Southwest Research Institute). 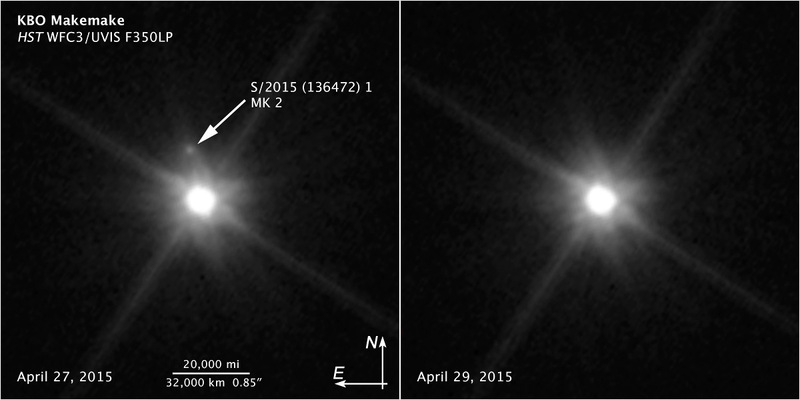 The moon — provisionally designated S/2015 (136472) 1 and nicknamed MK 2 — is more than 1,300 times fainter than Makemake. MK 2 was seen approximately 13,000 miles from the dwarf planet, and its diameter is estimated to be 100 miles. Makemake is 870 miles wide. 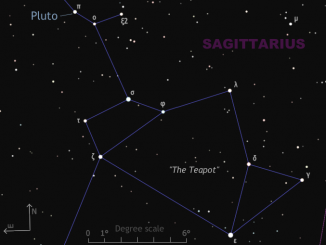 The dwarf planet, discovered in 2005, is named for a creation deity of the Rapa Nui people of Easter Island. The Kuiper Belt is a vast reservoir of leftover frozen material from the construction of our solar system 4.5 billion years ago and home to several dwarf planets. Some of these worlds have known satellites, but this is the first discovery of a companion object to Makemake. Makemake is one of five dwarf planets recognised by the International Astronomical Union. Image credit: NASA, ESA, and Z. Levay (STScI). Acknowledgment: NASA, ESA, and A. Parker (Southwest Research Institute). 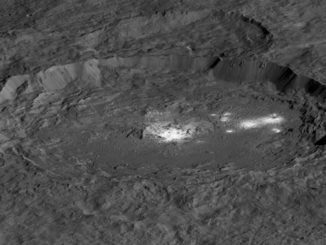 NASA has released simulated perspective views looking into Occator Crater, which contains the brightest area on Ceres. 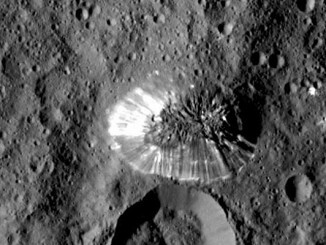 The views were created from images captured by the Dawn spacecraft.